Apple chief operating officer Tim Cook sang the praises of the forthcoming iPad, outlined the company’s plans for retail expansion, and gave an overview of the company’s other products during a wide-ranging talk before investors at the Goldman Sachs Technology & Internet Conference in San Francisco on Tuesday. Apple has posted the audio from Cook's presentation. The presentation is over 42 minutes long. The Apple COO didn’t have anything new to announce during his half-hour-long conversation with Goldman Sachs analyst David Bailey. But Cook’s comments do offer some insight into Apple’s approach as it enjoys record revenue and sales. The iMac is just one of the products that’s helped the Mac outgrow the overall PC market in 20 of the last 21 quarters. Cook noted that market research firm IDC puts the PC market at about 300 million units and compared that to the 10 million Macs Apple sold during its 2009 fiscal year. “The ceiling [for Apple] is still far off,” he said. Apple is also enjoying strong growth with the iPhone and iPod touch. The latter handheld, in particular, saw its sales double year-over-year in 2009. “That helps fuel more app sales, which helps fuel more developers, which helps make the [iPhone OS] platform stronger,” Cook said. In talking about Apple’s success, Cook focused on the company’s efforts to recruit top talent as well as its focus on core products. “This is the most focused company I know of, am aware of, or have any knowledge of,” Cook said. “We say no to good ideas every day” so that the company can keep its focus on a small number of areas. Cook took note of the tables conference attendees were sitting at, and pointed out that most of Apple’s product line could fit on those tables. “And we had revenue last year of $40 billion,” he added. But much of the focus of Cook’s talk Tuesday fell on the iPad—not surprising given that the tablet, unveiled last month, is slated to make its debut in March. Cook told attendees at the Goldman Sachs conference that he’s been using the iPad for six months now. “The experience is absolutely incredible,” he said. “It’s got a number of things that are appreciably better than anything available today,” added Cook, as he ticked off the device’s browsing, e-mail, and photo display capabilities. Echoing the same tack taken by Steve Jobs during the iPad launch event in January, Cook contrasted Apple’s forthcoming tablet with netbooks—low-cost PCs that offer browsing and e-mail capabilities in a stripped-down laptop. It’s Apple’s contention—repeated by Cook on Tuesday—that the only thing about netbooks that appeals to consumers is the price, and that the appeal wanes once users have spent any time with a netbook. Initially, Apple plans to offer the iPad through its direct sales channels, such as its online and brick-and-mortar stores. That will be supplemented by indirect channels such as the store-within-a-store concept at Best Buy retail outlets and Apple premium resellers overseas. Over time, Cook added, that sales effort could expand to other areas. “Where it goes and how fast it goes, we’ll see,” he added. Speaking of retail, Cook reiterated Apple’s goals for opening stores. The company plans to open between 25 to 50 stores per year, with it focusing on the lower end of that range since 2008 when “the world started to fall apart,” Cook said. On Tuesday, Cook noted the advantage of having a single-carrier relationship. Besides simplicity, dealing with one carrier allows Apple to “innovate and work with that carrier on a feature that would be difficult for multiple carriers to provide.” Take Visual Voicemail, for example—a feature that Apple and AT&T collaborated on for the iPhone’s initial release. While having multiple carriers gives Apple the chance to sell more iPhones, that’s largely the case in countries where carriers have what Cook described as “sticky” relationships with their customers, so that it makes sense to ink deals with more than one carrier. In the top 10 markets for the iPhone, Apple has relationships with single carriers in five of them. Of those, three markets feature exclusivity agreements while the other two allow Apple to add other carriers. 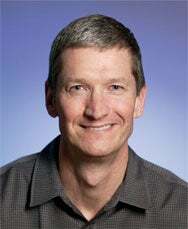 Cook noted that Apple took on multiple carriers in several existing markets in 2009, including France, the UK, Singapore, Canada, and the Scandinavian countries. In each of those cases, iPhone sales increased, though Cook quickly added that wouldn’t necessarily happen in every market if Apple were to add multiple carriers. “We look at each on a country-by-country basis,” he added.